Rukhsana is a good girl who loves her Bengali culture, its cuisine, and her family. She tries hard to please her mother and father, but it hurts that she can't be open with them. Telling them that she is gay is simply something one doesn't do. And this proves prescient when her mother discovers Rukhsana's romantic relationship with her girlfriend Araiana, and her parents totally freak out. They trick her to return to Bangladesh with them and then literally imprison her to force her to marry a man of their choosing. Desperate to escape, she finds an unexpected ally in her grandmother who reveals a set of family secrets which open her eyes. Through great difficulty, things are sorted out. The story, which reminded me strongly of Aisha Saeed's Written in the Stars, goes a bit further and in a slightly different direction. First, because it deals with a homosexual relationship; and secondly, because the family is eventually able to reconcile. This goal presents literary challenges to Khan as she has to work out a plausible way to get the family to turn around. The resulting story is not entirely successful and relies heavily on the parents seeing the error in their ways. 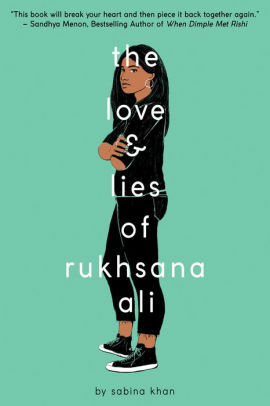 In fact, the most frustrating part of the book is that, while Rukhsana learns a number of things to make her more sympathetic to her mother (out of pity), there really is very little growth in her character. The weight of the character growth falls on everyone except Rukhsana -- who grows very little through her experience. I think there was room for everyone to do some development. While there are many good features of the novel, Khan's writing is a bit rough and the book grows dully repetitive. Every food item is mouth-watering, every discussion ends in tears, every argument results in someone (usually not Rukhsana) apologizing. I did like the characters themselves who, while not entirely shucking stereotypes about South Asians, were distinct and complex. And I loved the many cultural details (Khan really enjoys the cuisine and the clothing and never tired of describing both in ways that make one hungry and covetous). Moving from California to New Jersey is difficult for fourteen year-old Doreen. First of all, she has to hide her big fluffy tale to avoid notice from the other kids. Her ability to leap into trees and talk to squirrels is probably also best left out of sight. But no amount of super talents can counter the fact that the kids are not very friendly in New Jersey and neither are the squirrels! Using her regular girl powers, she tackles the first problem. But there is also danger afoot -- the type of danger that only a superhero can solve. The Avengers are not particularly interested in helping (despite some intervention from the squirrels), so it will fall upon Doreen to step up as Squirrel Girl! Someone is trapping squirrels in gruesome cages, hurting dogs, kidnapping babies, and trying to destroy their suburban town. Aided by both tree and ground squirrels and her classmates (dubbed the "squirrel scouts") they take on SG's nemesis, the Micro Manager! While I didn't know it before I started reading the novel, the character is based on a classic comic book. Being ignorant of that fact, I really liked the way the book started where Doreen is just a somewhat gawky middleschooler with a big secret. Our introduction to the squirrels is also particularly funny. And the regularly interspersed footnotes provide lots of snarkiness and humor. But when the superheros and villains start to appear (i.e., the comic book elements), my interest in the story evaporated. 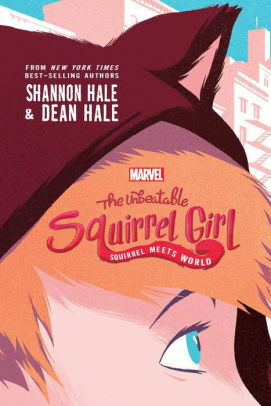 For most of the latter half of the book, we are treated to a number of in-jokes about Marvel characters (Avengers, in particular) and the sort of silly ultra-violence that fills most movie screens these days. Not only did I find it dull, but also that split focus leaves the story really struggling. Is it superhero adventure or is it just poking fun? In any case, it didn't really work either way. I honestly didn't see the point, but apparently the commercial success says otherwise. On the first day of school, Peppi Torres breaks her resolution to keep a low profile by tripping and spilling her bag in the hallway. Mortified, she lashes out at shy nerdy Jaime who tries to help her, pushing him away and yelling at him. Wracked by guilt in the aftermath, Peppi keeps trying to find a way to apologize to Jaime. Convinced that he hates her she can't work up the courage to just actually do so. It's all complicated by the fact that she's in the art club and he's in the science club, and the two clubs are in a cutthroat competition to be granted a table at the upcoming club fair. Things escalate as the clubs are pitted against each other to produce a contribution that will benefit the whole school In the end, though, it is Peppi's ability to cooperate with Jaime and the science club that will save the day. 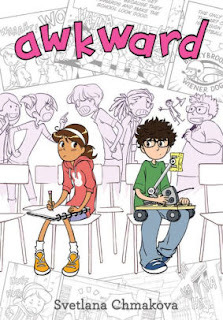 First in a series of graphic novels (as of now, there are three books in the series) that explore middle school life. It's a successful series, but I don't find much that is remarkable about the story or the artistry, although both are good quality. The book is entertaining and a fast read and the artwork and layouts quite competent. But my coolness to the book is creditable at least in part to the truth that I'm not a fan of graphic novels of this sort. They seem largely derivative of Japanese anime and in my opinion add little more than a change of milieu. In this set of eleven chapter-length essays, Chack recounts tales of her youth. They range from her year-long battle with cancer to her relationship with her long-term boyfriend. In between are observations about parties, periods, and incontinence. 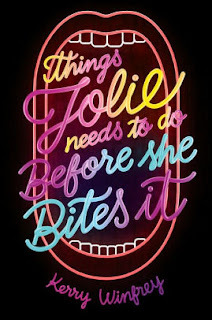 My favorite was her account of her day job writing click bait for Buzzfeed, but her observations on YA writer John Green were pretty amusing as well. It’s not particularly YA although the chapters that deal with her adolescence will be of interest to young readers. And it is not fiction either – just well-told life stories. So, it’s a bit far off from my usual radar. My take is that the writing is funny but the book is inconsequential. These are the types of essays that we all polish up in one form or another: stories to tell at parties about ourselves to make people laugh. They become polished because we have told them again and again. Nice essays, but not sure why they needed to be collected into a book. There isn’t much here that will stick with you. It takes the arrival of Claire in the beginning of their senior year to get Lizzy to come out of her shell. For years, Lizzy has laid low trying to hide from the embarrassment of having had a grand mal seizure in front of her whole school. And she's also struggled with being cossetted by her overprotective parents. But Claire doesn't know that history and doesn't treat Lizzy like she's fragile. Instead, she takes her into Philly and shows her how much fun they can have with fake IDs. But as brave as Claire seems, it is obvious that she has fears and secrets as well. And when Lizzy finds them out, it ends up destroying their friendship. At the same time, Lizzy also seems to be losing her boyfriend Matt to secrets revealed. While this drama comes together nicely in the end, it’s a convoluted story lacking much coherence along the way. 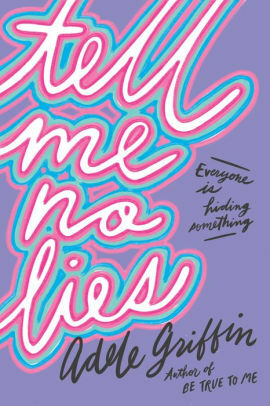 The theme (everyone has secrets that they are willing to lie for) is pretty thin upon which to hang this period piece on growing up on the Main Line in the Eighties. The Eighties details are pretty perfunctory, picking up scattered tropes from across the decade – mostly set in 1988-89, but not in any consistent way. The whole thing is probably autobiographical or at least based on personal experience, which is fine if there is a story there, but in this case there is not much. The Infinity is a spaceship designed to make a trip from Earth to Alpha Centauri at sub-light speed -- a trip that will take many decades to achieve. A tragic accident on the ship has killed most of the crew while they were in cryogenic sleep and the surviving adult passengers are killed in the aftermath. All that is left is Romy, an eleven year-old girl. Forced to learn how to take care of herself and so far away that communication with Earth takes years, Romy has to grow up fast. Over the subsequent five years she has managed the practicalities, although the loneliness and the nightmares persist. So, when Romy gets a message that another ship is coming and, because it is capable of faster speeds, will overtake her in a few years, she is excited to know she will have company. Over the next months, she gets to know the pilot of the other ship, a young man named J. He’s everything Romy could hope for – not just another human being, but a nice, young, handsome boy. She can’t wait for them to meet and her time alone to end. But then, things go terribly wrong and her adolescent dreams of romantic bliss and companionship are replaced by terror and a fight for survival. 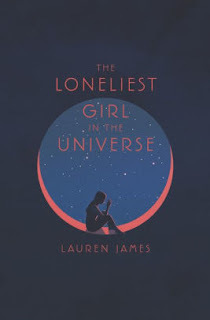 Two books in one: a character study of a sensitive and fairly realistic adolescent who has to rise to the occasion to survive and the science-fiction survival story in which she lives. It's a gripping adventure that had me from the very start, but full of more than the usual YA navel gazing due to the character being basically alone in her thoughts. The book is full of sci-fi tropes -- sub-light space travel, cryogenics, etc. -- so hardly breaks new ground, but I loved Romy and that made the book really fun to read. I think the book's dedication ("For all the girls who've never felt brave enough to be the hero in an adventure story") sums it up well. Lucie is a poor peasant girl, hired as a chambermaid in the chateau of Jean-Loup. He is a cruel and heartless man, as epitomized by his brutal sexual assault on Lucie. Pregnant and devastated, Lucie flees to the forest where she is cared for by an old woman who assures her that Jean-Loup’s reckoning is near. The old woman subsequently subjects Jean-Loup to several tests which he fails and she casts a spell which converts him into a horrible beast. Gleeful and vengeful, Lucie begs to be able to witness his humiliation and is transformed into a candlestick holder. Years of darkness fall on the chateau until an old man stumbles on the castle and begs for shelter. While there, he asks for his host to give him a rose for his daughter. The die is cast! And, while you think you know the rest of the story, this is where it grows interesting. 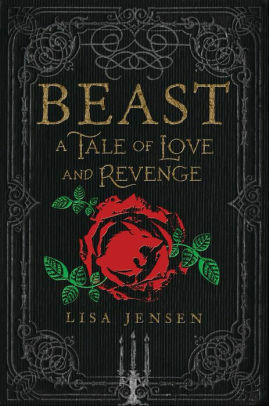 What if the Beast were a true gentleman (you’ve seen the Disney version, so don’t tell me that you can’t imagine it!)? And what if the man he was before was in fact the beastly cursed one? What would rescuing the man from the Beast actually achieve and what would be lost? 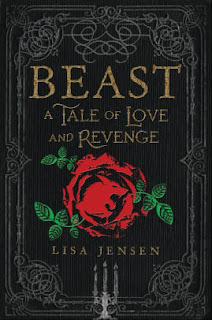 In this reimagining of the classic tale, Jensen poses these questions, keeping the original story intact, but addressing matters so blithely skipped over in the original. 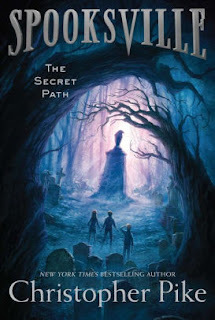 The story is a bit more mature than a YA fantasy usually is, but still a read that younger readers can enjoy. For me, it was a bit hard to drive Disney’s version out of my head at first and Rose is a poor replacement for Belle (whose role is actually played here by Lucie the candlestick – a most non-Jerry Orbach character if there ever was one!). The pacing is decent, although the various plot twists towards the end get dizzying and some elements (like Rose’s conniving family) are wasted. 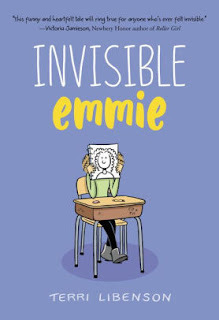 Seventh-grader Emmie isn't geeky or ugly or unpopular -- she's simply invisible. Talking to other kids (especially boys!) makes her revert to a puddle of slime. She lacks the confidence of her BFF Brianna (who's also a bit bossy!). Instead, she races through the hallways and hides in class trying to avoid being noticed. The contrast couldn't be any stronger with cool, outgoing, and popular Katie, whose life is bigger and brighter than anyone in the room. But when a particularly embarrassing and humiliating moment happens, Emmie and Katie discover a common bond and both girls find that they have something to learn from each other. Ostensibly a story about finding one's voice, this charming graphic novel navigates the familiar territory of building interpersonal skills, dealing with bullies, and forgiving human frailties. And while much of the material is cliche, Liberson approaches it with a delightful mixture of respect and knowing elder wisdom. 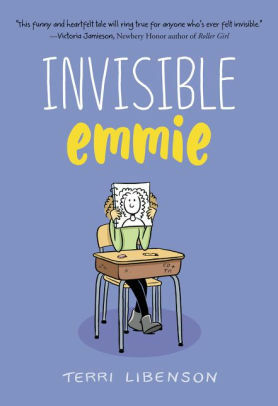 While I have no doubt that children will Emmie's observations about school and parents, this is the sort of book that is almost more fun for those of us who have been through it all. It is fun to look back with a knowing smirk that no matter how horrendous it all seemed at the time, this too shall pass (and perhaps to imagine that we were as much fun as Emmie)! Liberson's approach is full of warmth. I especially liked the supportive relationship between Emmie and Katie, who (despite being attracted to the same boy) don't let it get between them. A small twist at the end threatens the book's message, but I think Libenson has still managed to convey the idea that kindness in the end is what matters. In sum, a cute look at seventh grade through a witty and funny narrator. Adam has just moved with his family to the town of Springville. The first kid he meets is the loquacious Sally, who between being obsessed about her identity crisis and helping herself to a Coke that Adam was sent to the store to buy, informs Adam that the kids around the town refer to the place as "Spooksville." She then proceeds to tell him tales about all of the crazy things that happen in the town involving ghosts and witches. Meeting up later with Sally's friend Watch, the three of them embark on a quest to find a secret path that leads to another dimension where the town is replicated, but everything is dark and scary. There they must struggle with large spiders, a giant black knight, and an evil witch who wants to steal Adam's eyes. It's all in a day's adventures in this first of a long-running series popular in the 1990s and reprinted regularly since. I picked this one up on a recommendation from a friend who enjoyed reading the series as a child. It's easy to see the appeal. While hardly fine literature, the characters are endearing (Sally, with her snarky commentary and observations, was my personal favorite) and the action brisk. While much of that action doesn't make much sense, it doesn't stop us from enjoying an exciting ride. Sadly, the current cover fails to capture the lovely campiness of the first editions and makes this softcore horror book seem like it might actually be scary, instead of a fun read for middle schoolers. 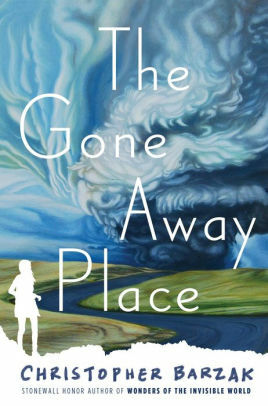 An atmospheric disturbance that spawns several huge tornadoes rips apart Ellie's hometown, wiping out most of the structures and killing nearly all of her close friends. In the aftermath, Ellie struggles with guilt, both for surviving when so many did not and for never reconciling with her boyfriend over the fight they were having the morning of the disaster. In the weeks that follow, Ellie becomes aware that she can sometimes see victims who are dead. Not only see the dead, but she can also actually communicate with them. She has the opportunity to visit with her late friends, help them reconcile to what has happen, and assist them (and her) in letting them go. But the person she most wants to see and with whom she most needs to reconcile -- her late boyfriend -- is the one she cannot find. A strange novel that struggles a bit with what it wants to be. 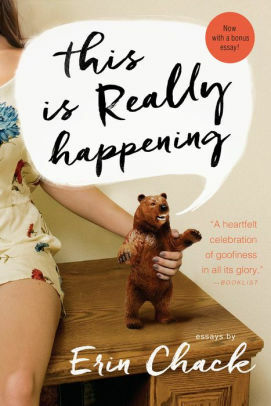 At its heart, this is a novel about grief and recovery. One of the most interesting parts of the book, before it veers into the supernatural, is simply recounting how physical recovery works after a natural disaster of this magnitude. And then, the book moves on to the emotional struggle with such a great loss of life. The ghosts represent a furthering of that, but then the story starts to suggest more sinister activity with ghosts taking possession of the living. This latter source of drama seems headed for some sort of violent showdown, but it never quite develops. The resulting storyline is meandering, as if the story has had a number of different endings and the author never quite cleaned it up. Jolie has an underbite. It's made chewing difficult and can be quite painful, but most of all, it's made Jolie shy and averse to being seen in public. But right after eleventh grade, she is having surgery to correct it. And when she does it, she knows that it will change everything. She’ll no longer have to hide, she’ll fall in love, and she’ll finally be able to compete with her perfect older sister Abbi. But she’s also afraid of the possibility that it could all go very bad. She might even die! 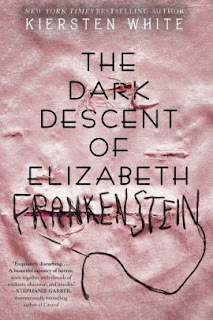 At seventeen So, with help from her friends Evelyn and Derek, she drafts up a list of things she wants to do before surgery in case she doesn’t survive. One of the goals (to kiss her crush) obligates her to try out for the school musical. Prior stage experiences have gone poorly and she's terrified of appearing before people. But to her surprise, she is cast as the lead and has to face her fears. Other parts of her plan go astray. Getting the chance to actually spend time with her crush (he’s the male lead) teaches her that maybe she doesn’t like him as much as she likes her loyal best friend Derek. Well, there’s not a lot new here. The story of the girl who wastes a whole novel searching for Mr. Perfect, when he is actually her best friend all of the time is old hat. Throw in a school play, a drunken cast party complete with vomiting on your friends, and the female BFF who gets neglected because you're obsessed with a boy. Oh, and add in a pregnant older sister -- why not? I’ve read this story a dozen+ times before. The oral surgery angle was interesting and different, but there simply isn’t enough here to justify another run at this tale.